My last three visits home were so filled with family matters that I couldn’t find even a moment to escape to the ocean a mere two miles away to get my feet deep in the sand and water as I otherwise always do. Today, the day after losing my dad, there was no way I wasn’t going to find my way there even with all the arrangements waiting to be made. We had a quick family lunch at the pier, all of us reconnecting on the way to and from various urgent errands, and as soon as I gave our server my order, I excused myself from the table, fled outside to the sand, then finally got my feet where they needed to be. I’d been there only a minute or two when a woman I didn’t know walked over, smiled, and said she couldn’t help watching because I reminded her of some sort of 1920s bathing beauty standing there in the water, in my dress and leggings, shoes in hand. Then she noticed my tears and I told her about my dad, and she hugged me in a way that meant everything. This is the picture she took of me, hand on my heart as I gazed at Catalina Island in the distance, crying as I thought of my dad and the many, many walks we’d walked on that same beach, laughing as a rogue wave (almost certainly sent at his request) unexpectedly splashed up to my knees as a sort of baptism in the sacred solace of my beloved Pacific, reveling and then relaxing in the certainty that my dad will always be with me, no matter where my feet are planted, or whether or not I’m appropriately attired for the experience. The Pacific Ocean, to be specific. And the sand and tidepools and cliffs and bluffs and surfers and swimmers and body-boarders and toe-dippers and piers and sandy towels and sunscreen (so much sunscreen) and wind and seagulls and sunsets and tar (okay, maybe not the tar) and lifeguard stations and dolphins and grunion runs (when the midnight moon is right) and whale watching excursions and the outline of Catalina Island 26 miles away, but only when the view is clear enough. 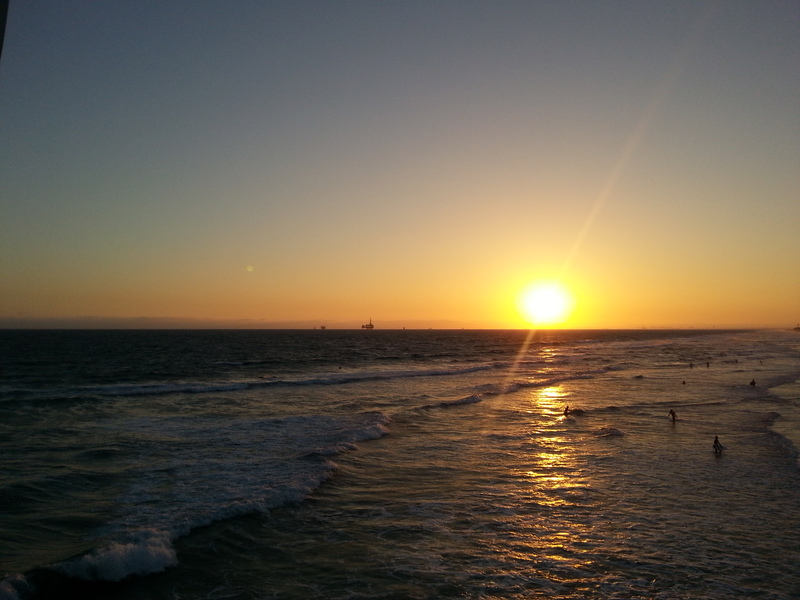 That’s why, whenever I get back to Huntington Beach, my very highest priority (after hugging my family, of course) is to get myself down to the ocean, dig my toes in the wet sand, and walk along the waveline until I once again feel the connection that tells me I’m home.